I love this class. I love this class so much, and I will submit it again next year! I hope that it gets on the schedule more than once, because everyone has a blast. The point of this class is to do something OTHER than derby in order to work on fundamental skills. Many of us get White Jacket Syndrome when we practice plows, hockey stops, edging, etc at training sessions. We have our coaches watching. We want to impress them. We want to get on that next roster. We’re worried about the skills of the people around us compared to our own. These games take that out of the equation. This is great to mix skill levels into, because you’re taking derby out of the equation – so EVERYONE is learning at the same pace. Though advanced skating skills can definitely be an advantage, there is more than pure experience on skates involved for most of these games. This is the game closest to roller derby. Only with an Ultimate Frisbee twist. Each jam is 2 minutes. Teams field the same players as usual, and we play on the derby track. Each team on the track has a ball. Players on that team must pass the ball THREE TIMES, successfully, between themselves in order to let their jammer try to leave the pack. The ball must always be PASSED, not handed off and opposing players are allowed to block passes. If the ball hits the floor, or is caught by an opposing team member, the 3 count is reset. After 3 passes are successful, the jammer (and to make it more advanced, the jammer OR pivot) may attempt to break the pack. 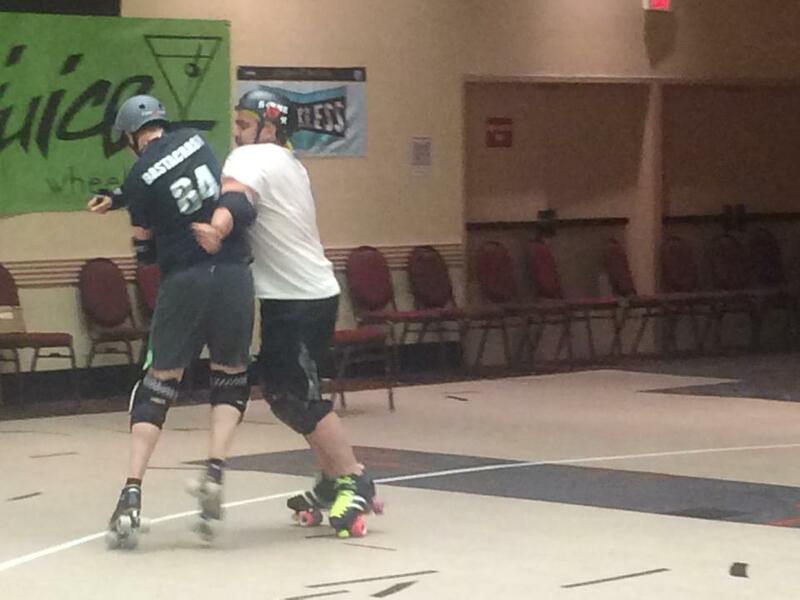 Your points are counted by how many times the jammer has left the pack. So yes, when one team completes their passes, the other team should be trying to stop that jammer from leaving the pack! While you can play this game in the classic “everyone sit on the floor” way, I like it better when it’s moving. Get your team into a pace line. I recommend doing this at a moderate speed for YOUR team (obviously London Roller Girls’ All Stars would be able to do this faster than a start-up league). The person at the back of the line goes first to make it easiest. As the advance up the pace line, they call out “duck” for those who are not chosen. When they decide that someone is the “goose” they complete a legal hit on that individual. That begins the race around the track back to the goose’s position in the line. Beginner version: It does not matter who makes it back to the goose’s place first. The GOOSE is now IT, regardless. They drop to the back of the line and begin playing. Advanced version: Whoever reaches the goose’s place in line successfully first (as in, they’re in the line and matching the line’s pace), are safe. The other person is now IT and drops to the back of the line to start playing. I will run this until everyone has been chosen at least once. Props needed: As many balls as you desire. I like to do 4-6 of varying sizes. Split your players into two teams. Place the balls in a line directly between the two groups. Blow a whistle to release them and let the dodgeball commence! Note: I had an interesting thing happen this year during this game. One team hung at the very back of the ‘engagement zone’ because they realized the balls wouldn’t fly that far. If you have players not participating in this way, don’t be afraid to shorten the boundaries they must stay within. No one is on a team. Every person is on their own team. Have all the skaters line up at one end (or you can split them into two ends). Those on the sideline each take a ball. The players are told that when the first ball hits the ground, they are released! You can either play this to the end, or do it until there are 3-5 players left. These players step to the side and then you play another round. Eventually you do a “championship” round! Props needed: A net, or other boundary marker for the two goals. An empty water gallon jug (you may want to have multiples for back-ups). This is exactly what it sounds like: you play soccer on roller skates, but you use a gallon jug instead of a soccer ball (the jug does not roll the same way, so it makes the game actually playable). Level 1 – NON CONTACT! Feel free to have refs around to regulate things like low blocks, back blocks, illegal contact, and hand balls (it is soccer after all). I play 5 v 5 and let the rounds go for 4 minutes OR until a team has scored 2 goals in that period. Then you switch out. Blood and Thunder. King of the Mountain. Queen of the Rink. Last Man Standing. 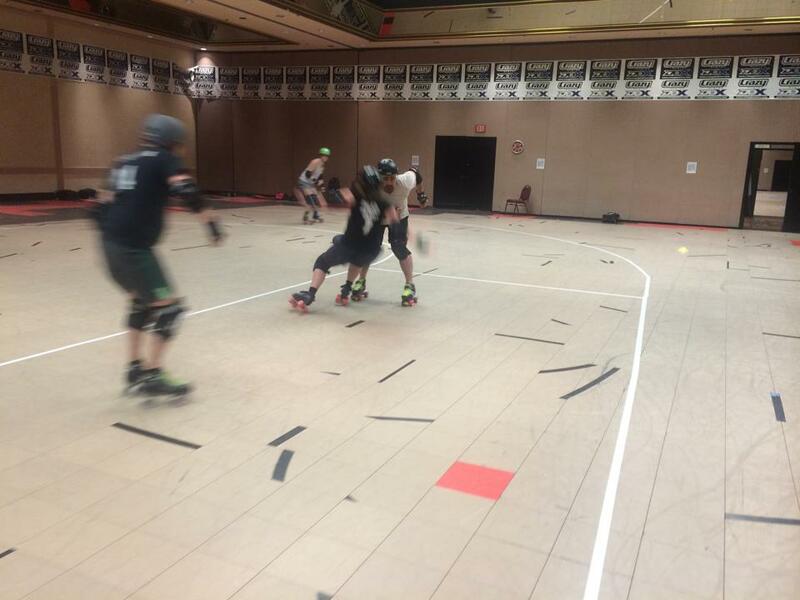 There are a ton of names for it, but in derby most of us have played the game where we all get on the track and hit the snot out of each other until one person remains. This is a version of that. Everyone starts skating, and when told to go, the carnage begins. When a skater is knocked down or goes out of bounds – they are out. In this version, do NOT have them stay on the track unless you have advanced skaters. You can also have refs calling penalties, and if anyone commits a penalty, they are also out. With this version, when two skaters connect, if NEITHER skater goes out or down, than BOTH of them must flip to begin skating the opposite direction. Every skater will always skate DERBY direction, it’s just a matter of whether they are forward or backward. You should have people on the outside reminding skaters to spin around when contacted. There’s always one that just doesn’t understand/remember that they have to flip around whenever someone touches them. This is another game that I like stopping each round when there are 3 people left, so that you can do several rounds, ending in a Championship. Props Needed: As many cones (minus one) as you have people playing. Every person playing gets a cone, except for one person. Each person should place the cone on the inside or outside edge of the track. The person in charge decides what stop the round will focus on. You can do an entire game of ONE stop, if you want. Everyone starts skating at pack speed. When the person in charge decides, they blow the whistle and everyone must get to a cone and use the stop APPROPRIATELY and without falling or advancing past the cone. If they are unsuccessful, a ref or wrangler should call them out and they must go to the NEXT cone and try it again. And if your league is looking for coaches and trainers, drop me a message at DerbyAmerica@gmail.com – DNA Coaching is currently booking boot camps and sessions and we’d love to talk to your league!